Are You Wasting Time? Or Learning? Here’s my alter Leg-O. The website (+) has many pirate-themed parts to build your Picture Yourself in Plastic Mini-Mizer but unfortunately, no one-legged options. It should be included in the book I’m reading right now. My wife Susan bought it for me at her school’s Scholastic Book Fair. 100 Ways to Waste Time is actually a project-based learning tool kit for middle school students. I’m discovering that it is suitable for all ages, and especially for anyone who has been hanging on to their imagination/daydreaming gifts. The book is written by Tim Bugbird, according to Amazon, but his name could also be an answer to a time-wasting exercise in the book. The trifold book includes a flick-able plastic frog, a small book of googly eye stickers, a booklet of time-wasting things to do, and a list of ideas on how to waste time. Think of five things you would do if you were a ferret. Take out all of your underwear and decide which will be your lucky pair. Write the name of the best computer game ever. And, think of three ways to make it even better. The book even comes with certificates for “Outstanding Time-Wasting.” If any of my readers feel they are outstanding time-wasters I’d love to hear from you. Answer one of my examples or tell me one of your own time-wasting ways. Please leave me a comment and I’ll post a certificate for you. The limited choices meant that my avatar would not look like Metal Beard from the The Lego Movie. However, Susan and I learned how to improve our avatars by working together. The future of learning, creativity, and real and virtual world problem-solving, will involve computers and the cloud. Like any good game, time-waster, or life lesson, learning will always need two or more players. 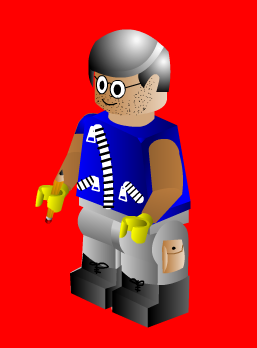 + Click here to create your own Lego Avatar.